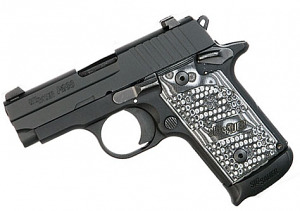 The new SIG SAUER P238 Extreme pistol is the ultimate choice for deep concealment or back-up gun, measuring only 5.5" by 3.96 " and weighing less than 1 pound. This pistol comes with SIGLITE night sights, black Nitron finish, Hogue G-10 grips and a SAO trigger with a manual thumb safety. Comes with one 7RD extended magazine.